We know that stress is bad for us. We see evidence of this in the news, we hear it from our doctors, and we feel it at the end of a hectic week. Health professionals have learned that stress interferes with our lives-it increases missed work days, can lead to relationship difficulties, and can increase the risk of turning to drugs and alcohol. It has also been shown that in some cases, chronic st… ress can increase our risk of developing certain serious illnesses. We know of all these negative effects that stress can cause, but, realistically, for most of us there's no end in sight-stressful events will crop up throughout our lives and even daily. We can't stop stressful events from happening, but we can change our lifestyles to better handle stressful situations. 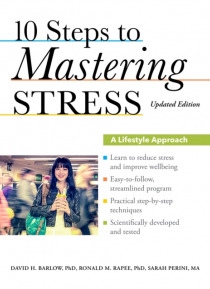 The authors of 10 Steps to Mastering Stress, renowned stress and anxiety experts David Barlow, Ronald Rapee, and Sarah Perini, have designed a proven step-by-step program that will help you identify what is causing your stress, teach you calming techniques, and provide you with a realistic approach to reducing your daily stress. This updated edition now includes:*detailed case studies based on real clients the authors have treated, so you can see how every stage of the program is implemented. *new material incorporating mindfulness-based stress reduction strategies and added information on how to deal with real-life problems. *streamlined steps that make the program more efficient and even easier to follow. Based on nearly two decades of research, 10 Steps to Mastering Stress has been scientifically developed and tested to ensure that it is the most effective way to control stress. Readers will learn valuable new skills-new ways of thinking, acting, and organizing their lives to reduce stress to a manageable level.